Dr. K. Shilpi Reddy is a qualified Obstetrician & Gynaecologist, experienced in Infertility and Hi-Risk Pregnancy cases. She has more than 15 years of clinical experience. She has completed her DNB in Obstetrics & Gynaecology from Yashoda Group of Hospitals, Hyderabad. She has also completed her post graduate diploma in Diabetology from Annamalai University, Tamil Nadu. She worked as a Senior Registrar at Image Super Specialty Hospital, Hyderabad. She has completed her fellowship in laparoscopic surgery in 2007 from BEAMS Mumbai under the supervision of laparoscopic surgeon Dr. Rakesh Sinha. She has a fellowship in infertility from Oasis Centre of Reproductive Medicine. She has worked as a Consultant, Sonologist, Diabetologist & Surgeon at Anupama Nursing Home, Ameerpet, Hyderabad. 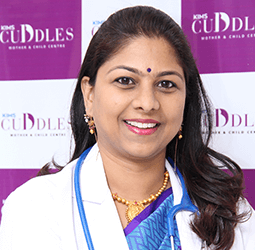 She has also worked as a Surgical Consultant (Obstetrics & Gynaecology) in Rainbow, Femina (Motherhood) and Lead Consultant at The Birth Place Hospital, Hyderabad. She has been performing minimal invasive surgery, pelvic reconstructive surgeries, tubal reconstruction and re-canalisation procedures with high surgical skills in HysteroLap and MiniLap procedures since a decade. She is experienced in managing post bariatric pregnancies, carrying out high risk complicated gynaecological surgeries of fibroids, endometriosis, and fertility restorative surgeries. She specializes in handling high risk pregnancies, recurrent pregnancy losses and infertility. She has been instrumental in AIDS Control Program across the state. With sheer hard work & dedication she manages women’s health efficiently and effectively. She has also a lot of papers & publications in her name. She is a very well known figure among her team members and patients as well. She is passionate about comprehensive healthcare for pregnant woman with medical and non medical support and improving the outcomes of pregnancy with yoga, water birthing and natural birthing. "Vivamus Luctus urna sed urna ultricies ac tempor dui sagttis. In condimentum facilisis porta."